12 Nights of Chocolate is an annual fundraising event where we invite the best chefs in the city (and beyond) to take over our space and create an experience, and there’s only one rule: use our chocolate, and run with it. 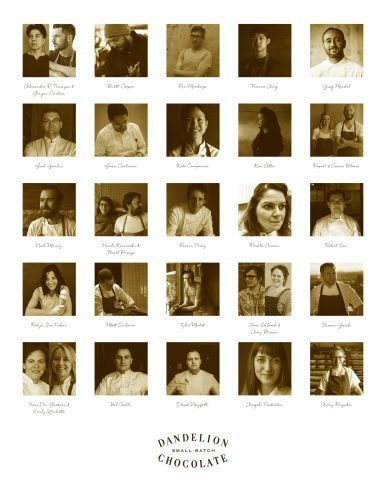 This is our fifth year and we couldn’t be more excited to announce the amazing line-up of chefs – 15 Michelin stars – not that we’re counting! Every evening is so unique, creative and different from the next: State Bird Provisions will be cooking from their just-released book; the ultimate ice-cream social with Salt & Straw, Revival and Smitten; Manresa Bread, Neighbor Bakehouse and Jane The Bakery are teaming up for “Bakery Night”; Toothache Magazine celebrate their forthcoming issue with Nick Muncy, Shawn Gawle, Kim Alter (Nightbird), Val Cantu (Californios), Rupert & Carrie Blease (Lord Stanley) – an all-star line-up. The dates are December 4th through 15th and most evenings will take place in a beautiful loft space on the second floor of our upcoming chocolate factory on 16th and Alabama, and others at our Valencia cafe. As in years past, all proceeds will go to the SF-Marin Food Bank, for whom last year’s event raised over 65,000 meals. A donation bin will be located inside our cafe for the duration of the event. Stop by to drop off cans and non-perishable food anytime during the holiday series. ← Come to our book launch party! Just met Greg at the Madison Chocolate Company. We were the ones who talked about Inn San Francisco. Just found out my son in law Ben Boer was Greg’s roommate at Brown. Small world.